ECB and the U.S. Fed essentially have the similar Keynesian idea: Central Bank's act of reducing interest rates and increasing money supply would discourage saving, stimulate spending and demand for goods, services and improve bank balance sheets and banks’ capacity to lend. This sounds nice in the context of Keynesian Economics; however, it has not worked quite that way in the U.S. despite Fed's massive money printing operation since 2008, an observation I'm sure Draghi 'overlooked' trying to repeat the proven ineffective steps of the Fed. During a liquidity trap...., increases in money supply are fully absorbed by excess demand for money (liquidity)....if money demand increases more than proportionally to the change in money supply due to the downward pressure LSAPs [Large Scale Asset Purchases] exert on the interest rate, the price level must fall to absorb the difference between the supply and demand of money. In the case of the Euro Zone, low interest rate by ECB may have helped those semi-insolvent PIIGS governments to refinance their insane levels of debt. Nevertheless, bond yield is supposed to be a risk measure. After ECB announced its new low interest rate, the Wall Street Yield Trade has rendered the yield of some Euro Zone government bond a total mis-representation of the related sovereign risk. For example, while U.S. 10-year Treasury yield is hovering around 2.6%, Spanish government can now borrow at 2.57%, a rate lower than Uncle Sam. Equally ridiculous is that Italy now only pays 2.70% (or only 0.1% above the U.S.) interest for its debt. The most recent reports on jobs, CPI, and PPI all suggest U.S. economy is picking up solid pace. 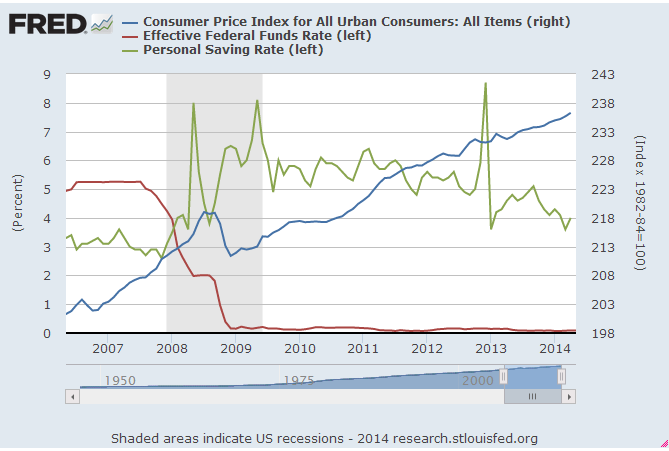 And the chart above also shows a downward shift of Personal Saving Rate. Saving Rate is trending down most likely due to better jobs market and inflationary pressure on everyday stuff (e.g., food and energy). Inflation is indeed heating up -- the average annualized inflation rate for 2014 (Jan. through Apr.) is around 5%, while the same inflation trend from the Producer Price Index (PPI) is well above 5%. ....more monetary injections during a liquidity trap can only reinforce the liquidity trap by keeping the inflation rate low (or the real return to money high). ....the correct monetary policy during a liquidity trap is not to further increase money supply or reduce the interest rate but to raise inflation expectations by raising the nominal interest rate. With both inflation and economic activity ramping up, we also believe that the Federal Reserve should raise interest rate to get ahead of the inflation curve and also to push the liquidity out of the 'risk free' Yield Trade, into more productive economic and business activity.